I had the best long weekend in DC. It included lots of time catching up with a few of my best friends, some great sightseeing adventures, and so much amazing food. 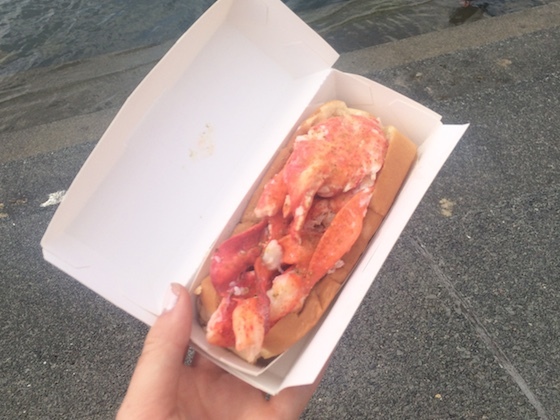 I wanted to share with you some of these delicious eats – both as my own travel memoir, and to show that treating yourself and enjoying special and unique culinary opportunities is key to maintaining balance and enjoying life – especially on vacation! I arrived in the city early Friday morning after a night flight across the country. I was staying with my friend Isabel and her boyfriend Wes in their apartment near the Capitol, so while they worked on Friday I explored. I walked on the Mall, stopped in to see an Impressionist exhibit at the National Gallery of Art, and toured the Library of Congress. 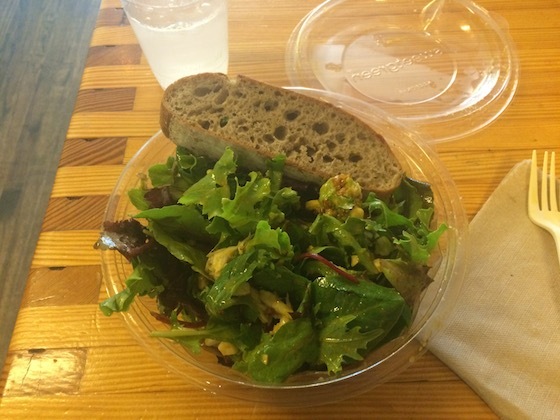 When I started to get hungry, I stopped at a lunch spot called Sweetgreen, per Isabel’s recommendation. I enjoyed this delicious salad with fresh Maryland crab, lot of veggies, and a unique carrot-chili vinaigrette. After Isabel finished work, we met up. Our first stop was an adorable Southern restaurant, where we sat for a couple of hours catching up over a refreshing drink. We both ordered a honeysuckle and lavender cocktail. 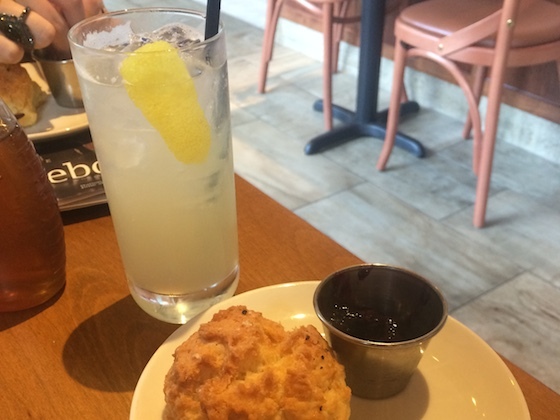 Of course, we also enjoyed the complimentary biscuits with blueberry jam. It was great to have this leisure time to simple chat and catch each other up on our lives. For dinner that night, we want to Isabel and Wes’ favorite sushi restaurant. 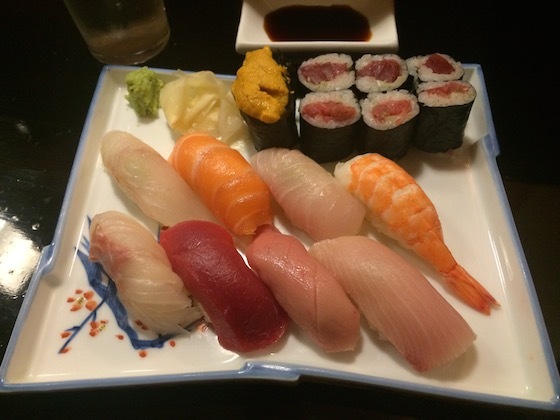 It was absolutely incredible – some of the best sushi I’ve ever had! We sat at the bar and ordered the chef’s special, which included the most amazing salmon and tuna along with flounder, sea bass, and sea urchin. I made sure to eat slowly and really savor each unique taste. Saturday was packed with fun activities and delicious food, too! Isabel and I headed to Georgetown in the morning for a nice stroll. I love this cute and bustling shopping area. 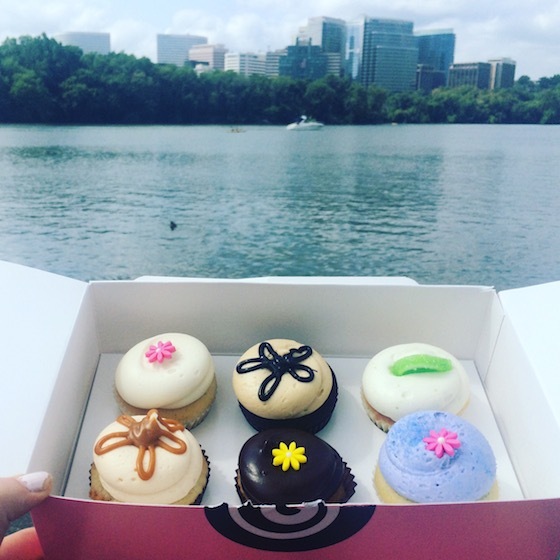 We picked up lobster rolls and ate them overlooking the Potomac River – an incredibly gourmet picnic! The seafood was so fresh and delicious. Of course, I also had to visit the famous Georgetown Cupcake for a taste of their special treats. These cakes definitely hold up to their reputation as some of the best cupcakes on the East Coast. I enjoyed the double butterscotch, which has the moistest crumb and an incredibly light yet rich frosting. On Saturday afternoon, another friend Robyn took the train up to meet us. It was great to see her! We went to Alexandria for a few hours, a cute town on the outskirts of DC. 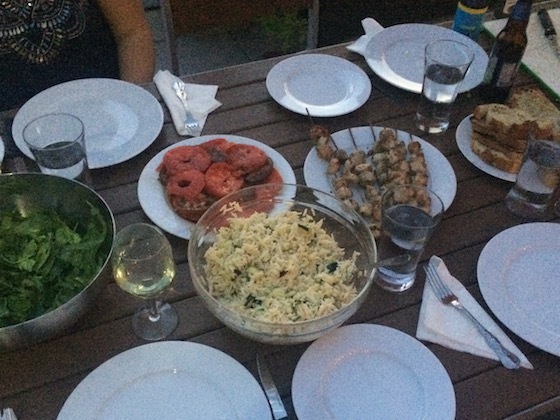 Then, for dinner that night, we headed up to the roof for a sunset barbecue. We focused the meal on a few delicacies from the local farmer’s market: fresh corn and zucchini, heirloom tomatoes, free range chicken, and goat cheese infused with lavender. We prepared the ingredients simply, so that their pure and fresh flavors were the highlight of the meal. The night ended with card games and homemade ice cream sandwiches (plus many spoonfuls of cookie dough, of course!). 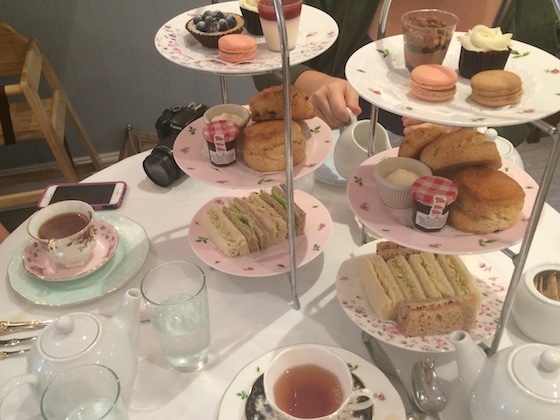 On Sunday we treated ourselves to high tea, since it’s a favorite of mine and Isabel and Robyn had never gone. We enjoyed the most amazing scones, plus sandwiches, pastries, macaroons, and of course lots of hot tea. I tried French Breakfast, a new one for me – it was delicately light and floral. All in all, a very fancy and fun experience! On Sunday afternoon, we went to the National Portrait Gallery, then lounged at the pool. After Robyn went home, Isabel and I whipped up an easy pasta dinner using one of her favorite go-to recipes. 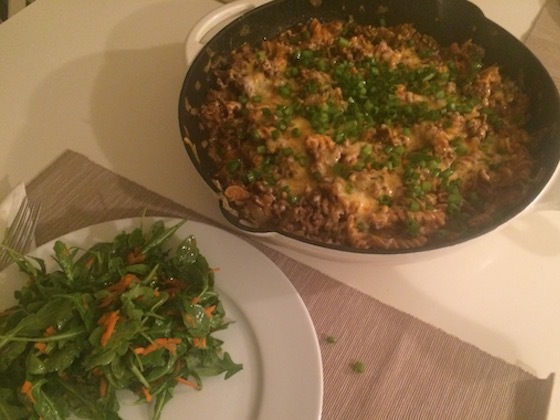 We added lots of arugula salad on the side. Monday was just as busy as the days before it – we really fit in a lot of fun activities! In the morning we met another friend, Amira, for brunch out. 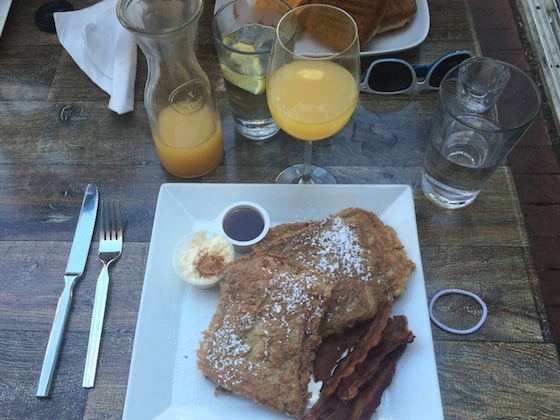 I ordered delicious vanilla cinnamon French toast, and we enjoyed mimosas – the perfect refreshing drink for a few hours spent chatting out in the sun. Next, we headed out to Virginia to do some wine tasting. We ended up at a vineyard in the country surrounded by lots of grape vines and even some horses! It was the perfect lazy afternoon spot, and after trying some wines we relaxed in the grass for quite a while. 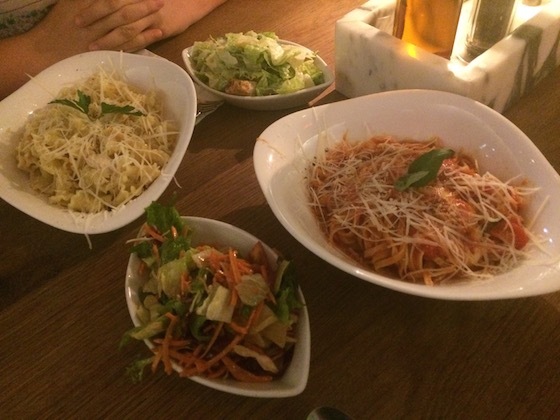 For our last dinner together, Isabel and I went to a casual Italian eatery where we shared some delicious pasta and salad. All in all, it was a busy, fun, and delicious weekend! I was so happy to be able to fit in so many uniques meals and East Coast classics. Now, I’m back in California and looking forward to lots of fruits and veggies in the next few days!